The Jonah Center’s most far-reaching project is to plan and build a mostly off-road bike route from the Air Line Trail in Portland to the Farmington Canal Heritage Trail in Cheshire. In partnership with the “RiverCOG” (our local Council of Governments, a planning agency), we gathered officials from Portland, Middletown, Meriden, and Cheshire in April 2016 to share this vision. All municipalities showed enthusiastic support, at least in principle. Since that meeting, we have focused on getting Middletown to commence design work on the Newfield Corridor Trail. Progress on the Newfield Corridor Trail and the Air Line Trail in Portland will, we hope, attract the attention and support of statewide transportation planners. 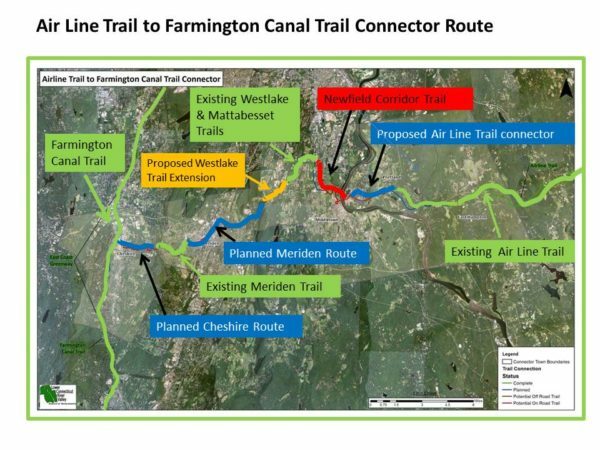 An Air Line Trail – Farmington Canal Trail Connector Route would provide many benefits to the towns involved and to the state as a whole. It would enhance existing shorter walking and cycling trails by greatly increasing the accessible mileage of each. Bicycle travel for school children and bicycle commuters would be vastly improved. It would provide a bike route to the commuter rail hub in downtown Meriden, which cyclists could use to travel to New Haven, Hartford, or Springfield and beyond. 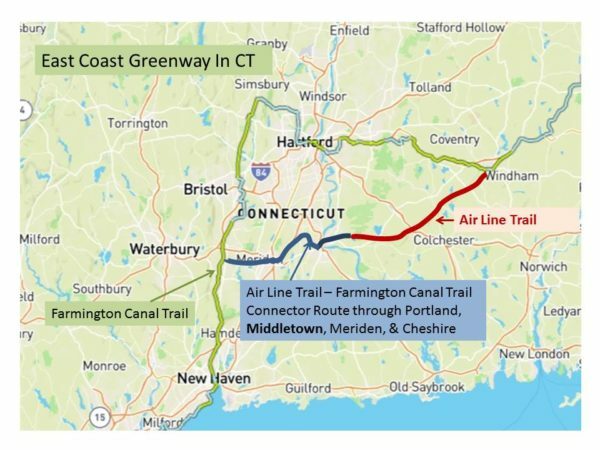 It would connect the Air Line Trail with the East Coast Greenway (see map at top of post) at two locations (Cheshire and Willimantic), thereby creating a 111-mile bike trail loop around the greater Hartford area. Such a facility would be sure to attract recreational bicyclists from a large surrounding area. The Jonah Center will continue to partner with the RiverCOG, local officials, state legislators, and state-wide bike-ped advocacy organizations to make this vision become a reality. The next 2 steps forward are likely to be completion of the Newfield Corridor Trail in Middletown and the extension of the Air Line Trail (westward from its current terminus) in Portland.